I know you’re busy grilling out and enjoying the three-day weekend with your kids and grandkids. But I know we are also taking time to honor our nation’s fallen military service members and reflect on their selfless patriotism. It’s thanks to them, and the many men and women who still serve, that our country is allowed to be the great, free country that it is. Some of you have called me a hero, and while I enjoy helping you generate a profit, we all know who the real heroes are — our military. I’m just able to do what I love, thanks to them. And, in that process, I bring you profits that can help you grow your wealth by hundreds of percent in the years to come. Today, I have another incredible opportunity that I don’t want you to miss out on — it’s the next major stock market rally. 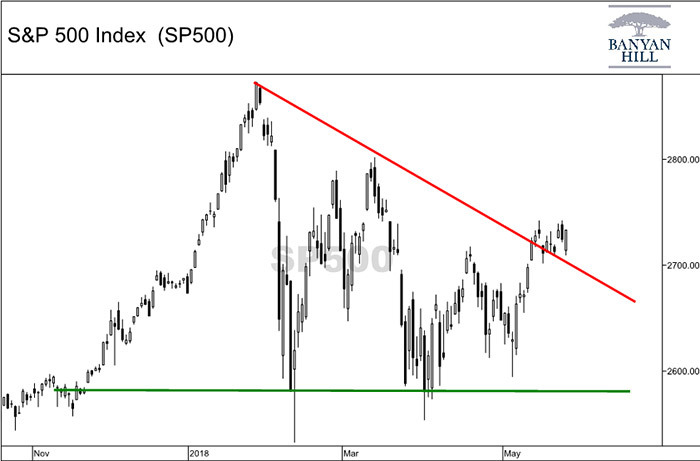 On May 11, I showed you a Chart of the Day that had the most important levels to watch on the S&P 500 Index. This chart tells us we can expect prices for the S&P 500 to shoot up to new all-time highs in the coming months. That’s because it formed a classic descending triangle pattern. And the best thing about triangle patterns is that they give us a clear price target once a breakout occurs. In this case, that target just north of 3,000 for the S&P 500. We get that target by taking the height of the pattern, from the green line to the start of the red line. That gives us 291. Then we add that to the point of the breakout, around 2,725. If the S&P 500 reaches the 3,000 level, and I believe it will, it will mark a new all-time high for the index. But it signals another enormous trend that I don’t want you to miss out on — the next major rally in this bull market. Putting two and two together, we can determine that this bull market is very well still intact. If the S&P 500 hits a new all-time high, as the descending triangle pattern predicts, that will erase worries of entering a bear market. And this next rally will be a tremendous opportunity. That’s because we are set to enter the euphoric stage for the stock market. Stocks will see sharp moves higher, and the gains are going to be fantastic — you won’t want to miss out. But it won’t be a straight shot higher. It’s going to be bumpy, and volatility is here to stay at least throughout this year. You just can’t let the stock market shake you out of this rally. Use volatility as an opportunity to jump back into this market, not exit.